LAFAYETTE, La. 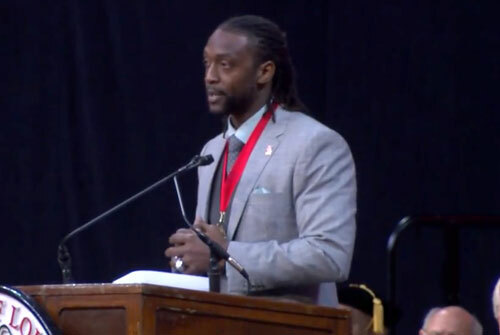 — Former UL Ragin’ Cajun and current Chicago Bears All-Pro cornerback, Charles Tillman, returned to his alma mater on Saturday, May 17, 2014 to deliver the University of Louisiana at Lafayette’s commencement address. Tillman spoke at the 11 a.m. general assembly for all graduates, their families and friends. Each academic college hands out degrees at separate ceremonies. Tillman, who was the winner of the 2013 Walter Payton Man of the Year Award, spoke about the importance of giving back and helping others. Tillman supports many charitable organizations. In 2005, he created the Cornerstone Foundation whose mission is to help improve the lives of critically and chronically ill children throughout Chicago. He created the foundation after his second-youngest daughter was diagnosed with cardiomyopathy. Tillman played for the Ragin’ Cajuns from 1999 to 2002. He earned a bachelor’s degree in criminal justice from UL in only three and a half years. He has played cornerback for the Chicago Bears since 2003. He’s a 2-time Pro Bowl selection and 3-time winner of the Brian Piccolo award. In February 2014, Tillman was named the Walter Payton NFL Man of the Year, which honors a player’s volunteer and charity work, as well as his excellence on the field. If you would like to book NFL athletes like Charles Tillman for a speaking engagement or appearance, you can contact Charles Tillman’s booking agent for speaker fees at Sports Speakers 360. For booking agent and appearance fee information on how to hire Chicago Bears players for appearances, call 1.855.303.5450.